Dell UltraSharp UP2716D 27 LED LCD Wide Screen 2560x1440 Display Monitor w/ PremierColor KV970 0KV970 CN-0KV970. Dell UltraSharp UP2716D 27 Series LED LCD Wide Screen 2560x1440 Resolution Display Monitor with PremierColor. Expect vivid, accurate color precision, ultrathin bezels and wide color coverage to suit your professional needs with the Dell UltraSharp 27 Monitor with PremierColor. Ideal color coverage: The new UP2716D Monitor with PremierColor offers wide coverage of industry color standards with four color spaces, plus user-enabled color customization. Youll also enjoy exceptional color accuracy and consistency right out of the box with an extremely precise Delta-E < 2 factory calibration. Outstanding view: Experience seamless dual or multi-monitor setup with ultrathin bezels. You can count on beautiful clarity with QHD resolution, plus consistent color across and ultrawide viewing angles. KV970 0KV970 CN-0KV970 Dell Model. Monitor Stand Display to Mini Display Cable USB Cable Power Cable. Preset Display Area (H x V). 200301.75 sq-mm (310.47 sq-inches). 1000 to 1 (typical), 2 Million to 1 (DCR). 178° vertical / 178° horizontal. Tilt, Swivel, Pivot, Height Adjust. 100% AdobeRGB , 100% sRGB, 100% REC709 and 98% DCI-P3 (delta E < 2). 0.2331 mm x 0.2331 mm. Height with stand (compressed /extended). 410.3 mm (16.15")/540.3 mm (21.27"). Weight (panel only - for VESA mount). 4.56 kg (10.05 lb). 9.52 kg (20.99 lbs) Connectivity DP mDP 2 x HDMI (MHL) 4 x USB3 with one charging port 2 x USB3 upstream (KVM) Electrical. 100-240 VAC / 50 or 60 Hz ± 3 Hz / 1.6 A (maximum). 45 W (typical), 40 W (Energy Star). Power Consumption Stand by / Sleep. Professional-grade color Count on consistent, accurate colors right out of the box with Dell PremierColor. Custom color modifications, incredible color depth and a wide color gamut meet your precise, professional standards. Wide color coverage: The new Dell UltraSharp 27 Monitor with PremierColor offers 100% Adobe RGB and 100% sRGB as well as two new color spaces: 100% REC 709 and 98% DCI-P3, which are ideal for video editors during post-production work and animation designers who deal with color-critical projects. Precise, accurate colors: Each monitor comes factory-color calibrated with a deltaE of less than 2, making any color differences between the desired color and onscreen color indistinguishable to the human eye. User-enabled adjustments: Dell's software development kit, or SDK, enables customers with a proprietary color solution to customize Dell UltraSharp Monitors with their preferred specifications. You can also fine-tune color parameters, including RGBCMY saturation, RGBCMY hue, RGB and RGB offset. Extensive color gamut: Youll appreciate a high level of detail even in dark areas with a color depth of 1.07 billion colors, Thats approximately 64 times more colors than standard monitors. Unparalleled viewing experience Enjoy an exceptional viewing experience made possible by ultrathin bezels, outstanding clarity, and ultrawide viewing. Seamless setup: Experience virtually seamless viewing across a dual- or multiple-monitor setup thanks to ultrathin bezels. Stunning resolution: Get amazing clarity with QHD resolution (2560 x 1440) for exceptional viewing on an expansive 27-inch screen with in-plane switching. Ultrawide angles: View consistent colors from every direction across an ultrawide 178°/178° viewing angle. Tilt, swivel or pivot clockwise or counter-clockwise to tailor this height-adjustable monitor to suit your needs. The advertisement of any product does not constitute an offer to sell. Your order does not signify our acceptance of your order, nor does it constitute confirmation of our offer to sell. We reserve the right to accept or decline your order. Ambiguity: In the event that something may seem ambiguous to you or you think we made a typo or a mistake. This agreement shall be construed under and in accordance with the laws of the state of Ohio, and all obligations of the Parties created in this Agreement are performable in Lake County, Ohio, United States of America. Powered by SixBit's eCommerce Solution. 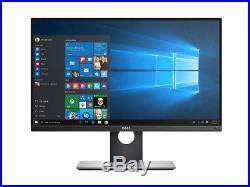 The item "DELL ULTRASHARP UP2716D 27 WIDESCREEN 2560X1440 LCD MONITOR PREMIERCOLOR KV970" is in sale since Tuesday, August 14, 2018. This item is in the category "Computers/Tablets & Networking\Monitors, Projectors & Accs\Monitors". The seller is "ascendtech" and is located in Cleveland, Ohio. This item can be shipped to United States, Canada, United Kingdom, Denmark, Romania, Slovakia, Bulgaria, Czech republic, Finland, Hungary, Latvia, Lithuania, Malta, Estonia, Australia, Greece, Portugal, Cyprus, Slovenia, Japan, Sweden, South Korea, Indonesia, Taiwan, South africa, Thailand, Belgium, France, Hong Kong, Ireland, Netherlands, Poland, Spain, Italy, Germany, Austria, Israel, Mexico, New Zealand, Philippines, Singapore, Switzerland, Norway, Saudi arabia, Ukraine, United arab emirates, Qatar, Kuwait, Bahrain, Croatia, Costa rica.